Hearing loss can be experienced in varying degrees, such as mild, moderate, moderately-severe, severe or profound. Additionally, this loss can also vary depending on pitches or frequencies. A series of hearing tests can determine the amount of loss you experience compared to an average of many other adult listeners with typical hearing. The volume of sounds you hear is measured in decibels (dB), 15-20 dB being the softest whisper and 120 dB being a jet engine. The softest sounds one can hear are called thresholds. Normal hearing thresholds for adults are considered 0-25 dB across the range of frequencies tested. Speech testing is also conducted as a part of this series of evaluations and helps to assess the levels of particular words you can hear clearly. These tests can help determine the type of hearing loss you’re experiencing, which can be categorized conductive, sensorineural or mixed. Conductive hearing loss occurs when there is a problem with the way sound is conducted to the inner ear and a structure called the cochlea. The problem may lie in the ear canal, eardrum (tympanic membrane) or the middle ear (ossicles and Eustachian tube). The inner ear and auditory nerve remain unaffected in this type of hearing loss. 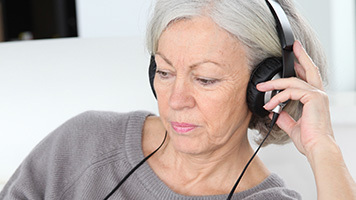 Symptoms for conductive hearing loss are similar to the other types; however, individuals may complain of sounds being muffled or far too quiet. Conductive hearing loss may be temporary or permanent, depending on the source of the problem. Medical management can correct some cases of conductive hearing loss, while hearing instruments may be a recommended treatment option in long-standing or permanent cases. Sensorineural hearing loss occurs when there is a problem with the sensory receptors of the hearing system, specifically in the cochlea of the inner ear or auditory nerve. The majority of sensorineural hearing loss occurs as a result of an abnormality or damage to the hair cells in the cochlea. This abnormality prevents sound from being transmitted to the brain normally, which results in a hearing loss. Individuals with sensorineural hearing loss may hear muffled speech, suffer from tinnitus (or ringing in the ears), have difficulty hearing in background noise or clarity of speech problems. Congenital: These hair cells have been abnormal since birth, which is considered a congenital condition. Damage to hair cells: A deficit in hearing also occurs when the cells are damaged as a result of genetics, infection, drugs, trauma or over-exposure to noise (late-onset or acquired). Sensorineural hearing losses are generally permanent and may remain stable or worsen over time. Routine hearing tests are needed to monitor the hearing loss. Hearing aids are the most common and successful treatment, allowing hearing professionals to adjust settings as needs change. Mixed hearing loss occurs when a person has a sensorineural hearing loss in combination with a conductive hearing loss. This means there is a problem in the inner ear as well as in the outer and/or middle ear. The conductive hearing loss may be temporary or permanent, depending on the source of the problem. Mixed hearing loss can sometimes be treated with medical management and hearing aids are a common treatment recommendation. Dr. Robert Herring and his staff are dedicated to providing the highest level of hearing health care with a patient centered approach. Customer service is a priority, not an afterthought.